Brand new to our program is this wonderful Meadows studio accommodating up to 4. This studio is comfortable for a small family or a couple with one queen bed and a pop up bunk bed. 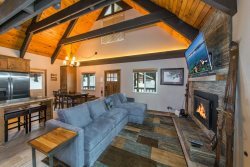 The rustic décor adds charm, while the private balcony and wood burning fireplace allow you to take in the crisp, mountain air or cozy up when it’s time to wind down. The kitchenette is fully equipped and dining table for four. There are ski lockers available in the common area. The Meadows also has a hot tub during the winter months but is not always guaranteed. As one of our most family friendly options, the Meadows has been known to welcome guests home with the wafting smells of home cooked meals and board games played in the spacious common area. This property’s safe, communal atmosphere makes it a popular choice for large groups with kids. The Meadow’s namesake feature, beautiful Kirkwood Meadow, takes off from the back side of the building, providing cross-country skiing trails in the winter, and wildflower-dotted trails in the summer. Easy access to the meadow and the serenity it provides is a huge selling point for many of our guests. The Meadows complex provides all guests with complimentary wifi access. The lobby area serves as a great meet-up space for families and groups before heading out, though comfy lounge chairs and a large central fireplace beckon you to sit and stay a while. A common area cooking facility is helpful for groups staying in separate condos, and a large sunny deck offers another place to mingle on nice days. Coin-op laundry facilities, ski lockers, and a seasonal indoor hot tub (NO hot tub May to Nov.) round out the amenities for this complex. NOTE: The HOA turns the boilers off from May to November but we provide fire wood and space heater so no forced heat during those months. 1 Bathroom - We provide towels, soap, shampoo, conditioner and hairdryer. We provide the following amenities: dining table seating for 4, full kitchen includes: gas stove, microwave, coffee maker, basic pots and pans, dishes and silverware. Flat Screen Smart TV, No cable, DVD Player. Wireless internet provided within the building. Public hot tub in building - winter only & not guaranteed. - Easy access to the meadow for cross country skiing. Very much appreciated on call person. Despite lots of other more pressing maintenance issues related to major snow storm, she took the time to come to our apartment to fix the garbage disposal. Always great- this year and for numerous past rentals. We had a great time once we had no heat issues to deal with. MANAGER RESPONSE: A space heater was provided to deal with building boiler issue. Check-In begins at 4:00PM and Check-Out is by 11:00AM. There is a 50% deposit due at the time of booking. The remaining balance will be automatically charged 30 days prior to arrival. Thank you for choosing us and let us know if you have any questions.